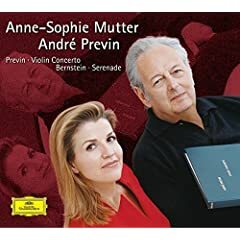 Andre Previn married Anne-Sophie Mutter! By the way, "Mutter" means "mother" in German. Did You See the Color Clues? 1918 - Jazz singer Ella Fitzgerald was born in Newport News Virginia. 1881 - Premiere of Gilbert & Sullivan's operetta Patience in London. 1926 - First performance of Puccini's opera Turandot. The composer died before he completed the work, and it was finished after his death. 1931 - First performance of Prokofiev's String Quartet #1 in b. 1956 - Elvis Presley reached #1 on US charts for the first time with Heartbreak Hotel. 1964 - World Without Love by Peter and Gordon reached #1 on UK charts. 1999 - First performance of Andre Previn's Bassoon Sonata. 2003 - Premiere of Robert X. Rodriguez's Flight, The Story of Wilbur and Orville Wright for female narrator and recorded airplane sounds. 2004 - Premiere of Bright Sheng�s The Boatman�s Song for children�s treble choir. John Knowles Paine died April 25, 1906. 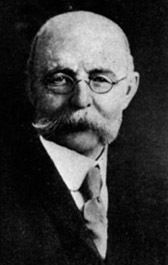 Paine was born in Portland, Maine on January 9, 1839. His father owned a music store and was conductor of the town band (a position that was also held by his grandfather), and began teaching him music. 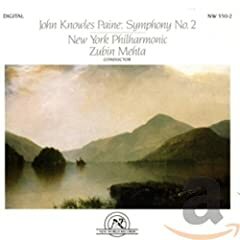 His talent was recognized early, and Paine became a student of Herman Kotzchmar, a German immigrant who came to the United States as an itinerant orchestral musician. Kotzchmar taught him organ, piano, harmony and counterpoint. Paine's music education progressed rapidly. By 1858 it was obvious that he needed to leave Portland to further his education. So Paine traveled to Germany to study organ performance, counterpoint and composition with Karl August Haupt as well as singing with Gustav William Teschner. While he was in Germany Paine began to develop a reputation as a very good organist, due to good reviews he received for recitals that he gave in Berlin. We read about Andre Previn below. He married a well known violinist who owns not one Stradivarius violin but two. They performed and have recorded together. Can You Guess who the violinist might be? Your mother might know! Go to the bottom of the page for the answer.. Mother's Day is Almost Here! Have You Thought About Her Gift Yet? Click the Bear for Gift Ideas for Fiddler Moms or Moms of Fiddlers! Gifts for Mother's Day or Graduation! Maybe a Year-End Gift for a Teacher! Paine completed his training in 1861, and returned to the United States. He was quickly hired as organist of the prestigous (Old) West Church in Boston. Paine's work was very much appreciated in Boston, and within six months he was approached by Harvard to join the faculty as a teacher of music. He was not promoted to the position of Professor until 1875. This made him the first Professor of Music in the United States. Paine's curriculum did not put much emphasis on American music of the time, but concentrated mainly on Bach and Palestrina. Other colleges followed Harvard's lead and hired professors of music. And the curricula at those colleges followed the basic plan that Paine had set forth. But Paine was not merely a teacher and organist. He also composed. He was the first US composer to publish a symphony It was well received. The premiere of his second symphony resulted in at least one of his listeners standing on his chair and cheering. Among Paine's works was a three-act opera titled Azara, which was included in its 1905-06 season. After John Knowles Paine's death on this date in April 25, 1906, his widow established the Paine Travelling Fellowship, awarded to students who show "distinguished talent and originality" in musical composition and scholarship.